For the most recent period cooler than present but without significant glaciation, see Little Ice Age. For the full sequence of geologically recent glacial advances and retreats, see Quaternary glaciation. For the geological epoch often associated with or referred to as "The Ice Age", see Pleistocene. For a generic geological period of reduced temperature and increased glaciation, see Ice age. "Last glacial" redirects here. For the period of maximum glacier extent during this time, see Last Glacial Maximum. The Last Glacial Period (LGP) occurred from the end of the Eemian interglacial to the end of the Younger Dryas, encompassing the period c. 115,000 – c. 11,700 years ago. This most recent glacial period is part of a larger pattern of glacial and interglacial periods known as the Quaternary glaciation extending from c. 2,588,000 years ago to present. The definition of the Quaternary as beginning 2.58 Ma is based on the formation of the Arctic ice cap. The Antarctic ice sheet began to form earlier, at about 34 Ma, in the mid-Cenozoic (Eocene–Oligocene extinction event). The term Late Cenozoic Ice Age is used to include this early phase. During this last glacial period there were alternating episodes of glacier advance and retreat. Within the last glacial period the Last Glacial Maximum was approximately 22,000 years ago. While the general pattern of global cooling and glacier advance was similar, local differences in the development of glacier advance and retreat make it difficult to compare the details from continent to continent (see picture of ice core data below for differences). Approximately 13,000 years ago, the Late Glacial Maximum began. The end of the Younger Dryas about 11,700 years ago marked the beginning of the Holocene geological epoch, which includes the Holocene glacial retreat. From the point of view of human archaeology, the last glacial period falls in the Paleolithic and early Mesolithic periods. When the glaciation event started, Homo sapiens were confined to lower latitudes and used tools comparable to those used by Neanderthals in western and central Eurasia and by Homo erectus in Asia. 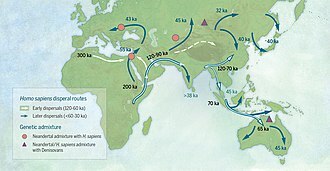 Near the end of the event, Homo sapiens migrated into Eurasia and Australia. 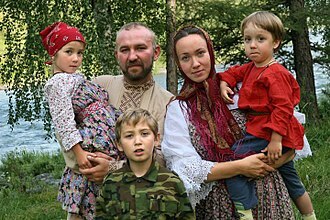 Archaeological and genetic data suggest that the source populations of Paleolithic humans survived the last glacial period in sparsely wooded areas and dispersed through areas of high primary productivity while avoiding dense forest cover. The last glacial period is sometimes colloquially referred to as the "last ice age", though this use is incorrect because an ice age is a longer period of cold temperature in which year-round ice sheets are present near one or both poles. Glacials are colder phases within an ice age in which glaciers advance; glacials are separated by interglacials. Thus, the end of the last glacial period, which was about 11,700 years ago, is not the end of the last ice age since extensive year-round ice persists in Antarctica and Greenland. 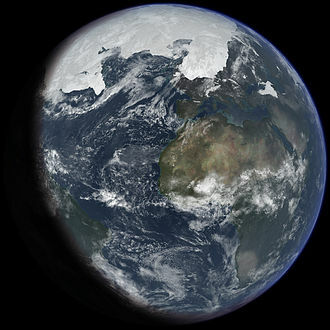 Over the past few million years the glacial-interglacial cycles have been "paced" by periodic variations in the Earth's orbit via Milankovitch cycles. The last glacial period is the best-known part of the current ice age, and has been intensively studied in North America, northern Eurasia, the Himalaya and other formerly glaciated regions around the world. The glaciations that occurred during this glacial period covered many areas, mainly in the Northern Hemisphere and to a lesser extent in the Southern Hemisphere. They have different names, historically developed and depending on their geographic distributions: Fraser (in the Pacific Cordillera of North America), Pinedale (in the Central Rocky Mountains), Wisconsinan or Wisconsin (in central North America), Devensian (in the British Isles), Midlandian (in Ireland), Würm (in the Alps), Mérida (in Venezuela), Weichselian or Vistulian (in Northern Europe and northern Central Europe), Valdai in Russia and Zyryanka in Siberia, Llanquihue in Chile, and Otira in New Zealand. The geochronological Late Pleistocene includes the late glacial (Weichselian) and the immediately preceding penultimate interglacial (Eemian) period. Canada was nearly completely covered by ice, as well as the northern part of the United States, both blanketed by the huge Laurentide Ice Sheet. Alaska remained mostly ice free due to arid climate conditions. Local glaciations existed in the Rocky Mountains and the Cordilleran Ice Sheet and as ice fields and ice caps in the Sierra Nevada in northern California. In Britain, mainland Europe, and northwestern Asia, the Scandinavian ice sheet once again reached the northern parts of the British Isles, Germany, Poland, and Russia, extending as far east as the Taymyr Peninsula in western Siberia. The maximum extent of western Siberian glaciation was reached by approximately 16,000–15,000 BC and thus later than in Europe (c. 20,000 – c. 16,000 BC). Northeastern Siberia was not covered by a continental-scale ice sheet. Instead, large, but restricted, icefield complexes covered mountain ranges within northeast Siberia, including the Kamchatka-Koryak Mountains. The Arctic Ocean between the huge ice sheets of America and Eurasia was not frozen throughout, but like today probably was only covered by relatively shallow ice, subject to seasonal changes and riddled with icebergs calving from the surrounding ice sheets. According to the sediment composition retrieved from deep-sea cores there must even have been times of seasonally open waters. Outside the main ice sheets, widespread glaciation occurred on the highest mountains of the Alps−Himalaya mountain chain. In contrast to the earlier glacial stages, the Würm glaciation was composed of smaller ice caps and mostly confined to valley glaciers, sending glacial lobes into the Alpine foreland. The [[Pirenees], the highest massifs of the Carpathian Mountains and the Balkanic peninsula mountains and to the east the Caucasus and the mountains of Turkey and Iran were capped by local ice fields or small ice sheets. In the Himalaya and the Tibetan Plateau, glaciers advanced considerably, particularly between 45,000 and 25,000 BC, but these datings are controversial. The formation of a contiguous ice sheet on the Tibetan Plateau is controversial. Other areas of the Northern Hemisphere did not bear extensive ice sheets, but local glaciers in high areas. Parts of Taiwan, for example, were repeatedly glaciated between 42,250 and 8,680 BCE as well as the Japanese Alps. In both areas maximum glacier advance occurred between 58,000 and 28,000 BCE. To a still lesser extent glaciers existed in Africa, for example in the High Atlas, the mountains of Morocco, the Mount Atakor massif in southern Algeria, and several mountains in Ethiopia. In the Southern Hemisphere, an ice cap of several hundred square kilometers was present on the east African mountains in the Kilimanjaro massif, Mount Kenya and the Rwenzori Mountains, still bearing remnants of glaciers today. Glaciation of the Southern Hemisphere was less extensive because of current configuration of continents. Ice sheets existed in the Andes (Patagonian Ice Sheet), where six glacier advances between 31,500 and 11,900 BC in the Chilean Andes have been reported. Antarctica was entirely glaciated, much like today, but the ice sheet left no uncovered area. In mainland Australia only a very small area in the vicinity of Mount Kosciuszko was glaciated, whereas in Tasmania glaciation was more widespread. An ice sheet formed in New Zealand, covering all of the Southern Alps, where at least three glacial advances can be distinguished. Local ice caps existed in Irian Jaya, Indonesia, where in three ice areas remnants of the Pleistocene glaciers are still preserved today. Small glaciers developed in a few favorable places in Southern Africa during the last glacial period. [A][B] These small glaciers would have developed in the Lesotho Highlands and parts of the Drakensberg. The development of glaciers was likely aided by localized cooling indebted to shading by adjacent cliffs. Various moraines and former glacier niches have been identified in the eastern Lesotho Highlands, above 3,000 m.a.s.l. and on south-facing slopes, a few kilometres west of the Great Escarpment. Studies suggest the mountains of Southern Africa were mostly subject to mild periglaciation during the last glacial cycle and the annual average temperatures were about 6 °C colder than at present. The estimated 6 °C temperature drop for Southern Africa is in line with temperature drops estimated for Tasmania and southern Patagonia during the same time. The environment of the Lesotho Highlands during the Last Glacial Maximum was one of a relatively arid periglaciation without permafrost but with deep seasonal freezing on south-facing slopes. Periglaciation in the Eastern Drakensberg and Lesotho Highlands produced solifluction deposits, blockfields and blockstreams, and stone garlands. Scientists from the Center for Arctic Gas Hydrate, Environment (CAGE) and Climate at the Arctic University of Norway, published a study in June 2017 describing over a hundred ocean sediment craters, some 3,000 meters wide and up to 300 meters deep, formed by explosive eruptions of methane from destabilized methane hydrates, following ice-sheet retreat during the last glacial period, around 12,000 years ago. These areas around the Barents Sea still seep methane today. The study hypothesized that existing bulges containing methane reservoirs could eventually have the same fate. During the last glacial period Antarctica was blanketed by a massive ice sheet, much as it is today. The ice covered all land areas and extended into the ocean onto the middle and outer continental shelf. 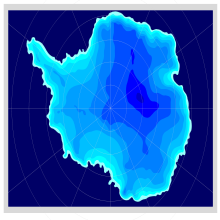 According to ice modelling, ice over central East Antarctica was generally thinner than today. British geologists refer to the last glacial period as the Devensian. Irish geologists, geographers, and archaeologists refer to the Midlandian glaciation as its effects in Ireland are largely visible in the Irish Midlands. The name Devensian is derived from the Latin Dēvenses, people living by the Dee (Dēva in Latin), a river on the Welsh border near which deposits from the period are particularly well represented. The effects of this glaciation can be seen in many geological features of England, Wales, Scotland, and Northern Ireland. Its deposits have been found overlying material from the preceding Ipswichian stage and lying beneath those from the following Holocene, which is the stage we are living in today. This is sometimes called the Flandrian interglacial in Britain. The latter part of the Devensian includes Pollen zones I-IV, the Allerød oscillation and Bølling oscillation, and Oldest Dryas, the Older Dryas and Younger Dryas cold periods. Alternative names include: Weichsel glaciation or Vistulian glaciation (referring to the Polish river Vistula or its German name Weichsel). Evidence suggests that the ice sheets were at their maximum size for only a short period, between 25,000 and 13,000 BP. Eight interstadials have been recognized in the Weichselian, including: the Oerel, Glinde, Moershoofd, Hengelo and Denekamp; however correlation with isotope stages is still in process. During the glacial maximum in Scandinavia, only the western parts of Jutland were ice-free, and a large part of what is today the North Sea was dry land connecting Jutland with Britain (see Doggerland). 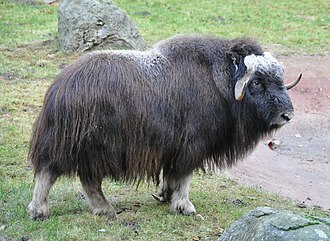 It is also in Denmark that the only Scandinavian ice-age animals older than 13,000 BCE are found. The Baltic Sea, with its unique brackish water, is a result of meltwater from the Weichsel glaciation combining with saltwater from the North Sea when the straits between Sweden and Denmark opened. Initially, when the ice began melting about 10,300 BP, seawater filled the isostatically depressed area, a temporary marine incursion that geologists dub the Yoldia Sea. Then, as post-glacial isostatic rebound lifted the region about 9500 BP, the deepest basin of the Baltic became a freshwater lake, in palaeological contexts referred to as Ancylus Lake, which is identifiable in the freshwater fauna found in sediment cores. The lake was filled by glacial runoff, but as worldwide sea level continued rising, saltwater again breached the sill about 8000 BP, forming a marine Littorina Sea which was followed by another freshwater phase before the present brackish marine system was established. "At its present state of development, the marine life of the Baltic Sea is less than about 4000 years old", Drs. Thulin and Andrushaitis remarked when reviewing these sequences in 2003. Overlying ice had exerted pressure on the Earth's surface. As a result of melting ice, the land has continued to rise yearly in Scandinavia, mostly in northern Sweden and Finland where the land is rising at a rate of as much as 8–9 mm per year, or 1 meter in 100 years. This is important for archaeologists since a site that was coastal in the Nordic Stone Age now is inland and can be dated by its relative distance from the present shore. The term Würm is derived from a river in the Alpine foreland, approximately marking the maximum glacier advance of this particular glacial period. The Alps were where the first systematic scientific research on ice ages was conducted by Louis Agassiz at the beginning of the 19th century. Here the Würm glaciation of the last glacial period was intensively studied. Pollen analysis, the statistical analyses of microfossilized plant pollens found in geological deposits, chronicled the dramatic changes in the European environment during the Würm glaciation. 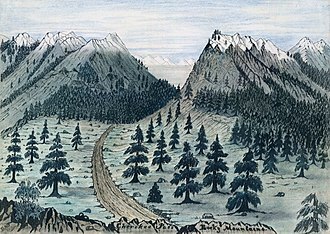 During the height of Würm glaciation, c. 24,000 – c. 10,000 BP, most of western and central Europe and Eurasia was open steppe-tundra, while the Alps presented solid ice fields and montane glaciers. Scandinavia and much of Britain were under ice. During the Würm, the Rhône Glacier covered the whole western Swiss plateau, reaching today's regions of Solothurn and Aarau. In the region of Bern it merged with the Aar glacier. The Rhine Glacier is currently the subject of the most detailed studies. Glaciers of the Reuss and the Limmat advanced sometimes as far as the Jura. Montane and piedmont glaciers formed the land by grinding away virtually all traces of the older Günz and Mindel glaciation, by depositing base moraines and terminal moraines of different retraction phases and loess deposits, and by the pro-glacial rivers' shifting and redepositing gravels. Beneath the surface, they had profound and lasting influence on geothermal heat and the patterns of deep groundwater flow. The Pinedale (central Rocky Mountains) or Fraser (Cordilleran Ice Sheet) glaciation was the last of the major glaciations to appear in the Rocky Mountains in the United States. The Pinedale lasted from approximately 30,000 to 10,000 years ago and was at its greatest extent between 23,500 and 21,000 years ago. This glaciation was somewhat distinct from the main Wisconsin glaciation as it was only loosely related to the giant ice sheets and was instead composed of mountain glaciers, merging into the Cordilleran Ice Sheet. The Cordilleran Ice Sheet produced features such as glacial Lake Missoula, which would break free from its ice dam causing the massive Missoula Floods. USGS geologists estimate that the cycle of flooding and reformation of the lake lasted an average of 55 years and that the floods occurred approximately 40 times over the 2,000 year period between 15,000 and 13,000 years ago. Glacial lake outburst floods such as these are not uncommon today in Iceland and other places. The Wisconsin Glacial Episode was the last major advance of continental glaciers in the North American Laurentide Ice Sheet. At the height of glaciation the Bering land bridge potentially permitted migration of mammals, including people, to North America from Siberia. It radically altered the geography of North America north of the Ohio River. At the height of the Wisconsin Episode glaciation, ice covered most of Canada, the Upper Midwest, and New England, as well as parts of Montana and Washington. On Kelleys Island in Lake Erie or in New York's Central Park, the grooves left by these glaciers can be easily observed. In southwestern Saskatchewan and southeastern Alberta a suture zone between the Laurentide and Cordilleran ice sheets formed the Cypress Hills, which is the northernmost point in North America that remained south of the continental ice sheets. With the assistance of several very broad glacial lakes, it released floods through the gorge of the Upper Mississippi River, which in turn was formed during an earlier glacial period. In its retreat, the Wisconsin Episode glaciation left terminal moraines that form Long Island, Block Island, Cape Cod, Nomans Land, Martha's Vineyard, Nantucket, Sable Island, and the Oak Ridges Moraine in south central Ontario, Canada. In Wisconsin itself, it left the Kettle Moraine. The drumlins and eskers formed at its melting edge are landmarks of the Lower Connecticut River Valley. In the Sierra Nevada, there are three named stages of glacial maxima (sometimes incorrectly called ice ages) separated by warmer periods. These glacial maxima are called, from oldest to youngest, Tahoe, Tenaya, and Tioga. The Tahoe reached its maximum extent perhaps about 70,000 years ago. Little is known about the Tenaya. The Tioga was the least severe and last of the Wisconsin Episode. It began about 30,000 years ago, reached its greatest advance 21,000 years ago, and ended about 10,000 years ago. In Northwest Greenland, ice coverage attained a very early maximum in the last glacial period around 114,000. After this early maximum, the ice coverage was similar to today until the end of the last glacial period. Towards the end, glaciers readvanced once more before retreating to their present extent. According to ice core data, the Greenland climate was dry during the last glacial period, precipitation reaching perhaps only 20% of today's value. The name Mérida Glaciation is proposed to designate the alpine glaciation which affected the central Venezuelan Andes during the Late Pleistocene. Two main moraine levels have been recognized: one with an elevation of 2,600–2,700 m (8,500–8,900 ft), and another with an elevation of 3,000–3,500 m (9,800–11,500 ft). The snow line during the last glacial advance was lowered approximately 1,200 m (3,900 ft) below the present snow line, which is 3,700 m (12,100 ft). 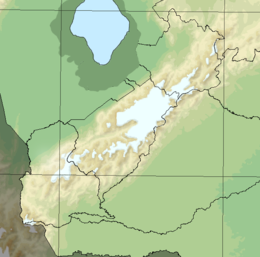 The glaciated area in the Cordillera de Mérida was approximately 600 km2 (230 sq mi); this included the following high areas from southwest to northeast: Páramo de Tamá, Páramo Batallón, Páramo Los Conejos, Páramo Piedras Blancas, and Teta de Niquitao. 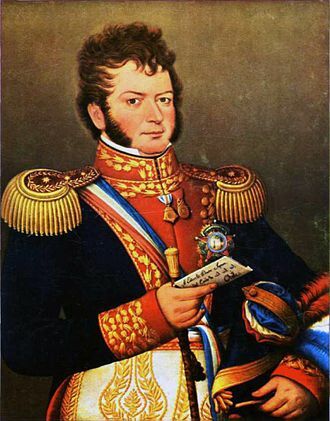 Approximately 200 km2 (77 sq mi) of the total glaciated area was in the Sierra Nevada de Mérida, and of that amount, the largest concentration, 50 km2 (19 sq mi), was in the areas of Pico Bolívar, Pico Humboldt [4,942 m (16,214 ft)], and Pico Bonpland [4,983 m (16,348 ft)]. Radiocarbon dating indicates that the moraines are older than 10,000 BP, and probably older than 13,000 BP. The lower moraine level probably corresponds to the main Wisconsin glacial advance. The upper level probably represents the last glacial advance (Late Wisconsin). 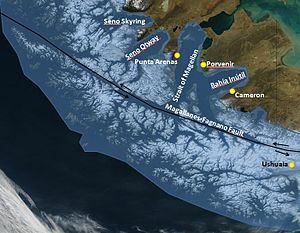 Map showing the extent of the Patagonian Ice Sheet in the Strait of Magellan area during the last glacial period. Selected modern settlements are shown with yellow dots. The Llanquihue glaciation takes its name from Llanquihue Lake in southern Chile which is a fan-shaped piedmont glacial lake. 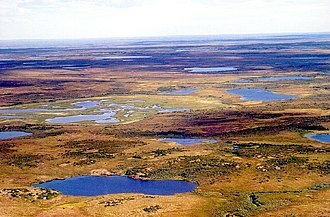 On the lake's western shores there are large moraine systems of which the innermost belong to the last glacial period. Llanquihue Lake's varves are a node point in southern Chile's varve geochronology. During the last glacial maximum the Patagonian Ice Sheet extended over the Andes from about 35°S to Tierra del Fuego at 55°S. The western part appears to have been very active, with wet basal conditions, while the eastern part was cold based. Cryogenic features like ice wedges, patterned ground, pingos, rock glaciers, palsas, soil cryoturbation, solifluction deposits developed in unglaciated extra-Andean Patagonia during the Last Glaciation. However, not all these reported features have been verified. The area west of Llanquihue Lake was ice-free during the LGM, and had sparsely distributed vegetation dominated by Nothofagus. Valdivian temperate rain forest was reduced to scattered remnants in the western side of the Andes. ^ Prior to the 2010s there was considerable debate on whether Southern Africa was glaciated during the last glacial cycle or not. ^ The former existence of large glaciers or deep snow cover over much of the Lesotho Highlands has been judged unlikely considering the lack of glacial morphology (e.g. rôche moutonnées) and the existence of periglacial regolith that has not been reworked by glaciers. Estimates of the mean annual temperature in Southern Africa during the Last Glacial Maximum indicate the temperatures were not low enough to initiate or sustain a widespread glaciation. The former existence of rock glaciers or large glaciers is according to the same study ruled out, because of a lack of conclusive field evidence and the implausibility of the 10-17° C temperature drop, relative to the present, that such features would imply. ^ Clayton, Lee; Attig, John W.; Mickelson, David M.; Johnson, Mark D.; Syverson, Kent M. "Glaciation of Wisconsin" (PDF). Dept. Geology, University of Wisconsin. ^ Gavashelishvili, A.; Tarkhnishvili, D. (2016). "Biomes and human distribution during the last ice age". Global Ecology and Biogeography. 25 (5): 563–574. doi:10.1111/geb.12437. ^ Crowley, Thomas J. (1995). "Ice age terrestrial carbon changes revisited". Global Biogeochemical Cycles. 9 (3): 377–389. Bibcode:1995GBioC...9..377C. doi:10.1029/95GB01107. ^ Catt, J. A.; et al. (2006). "Quaternary: Ice Sheets and their Legacy". In Brenchley, P. J.; Rawson, P. F. The Geology of England and Wales (2nd ed.). London: The Geological Society. pp. 451–52. ISBN 978-1-86239-199-4. ^ Clark, D.H. Extent, timing, and climatic significance of latest Pleistocene and Holocene glaciation in the Sierra Nevada, California (PDF 20 Mb) (Ph.D.). Seattle: Washington University. ^ Möller, P.; et al. (2006). "Severnaya Zemlya, Arctic Russia: a nucleation area for Kara Sea ice sheets during the Middle to Late Quaternary" (PDF 11.5 Mb). Quaternary Science Reviews. 25 (21–22): 2894–2936. Bibcode:2006QSRv...25.2894M. doi:10.1016/j.quascirev.2006.02.016. ^ Gualtieri, Lyn; et al. (May 2003). "Pleistocene raised marine deposits on Wrangel Island, northeast Siberia and implications for the presence of an East Siberian ice sheet". Quaternary Research. 59 (3): 399–410. Bibcode:2003QuRes..59..399G. doi:10.1016/S0033-5894(03)00057-7. ^ Barr, I.D; Clark, C.D. (2011). "Glaciers and Climate in Pacific Far NE Russia during the Last Glacial Maximum". Journal of Quaternary Science. 26 (2): 227. Bibcode:2011JQS....26..227B. doi:10.1002/jqs.1450. ^ Spielhagen, Robert F.; et al. (2004). "Arctic Ocean deep-sea record of northern Eurasian ice sheet history". Quaternary Science Reviews. 23 (11–13): 1455–83. Bibcode:2004QSRv...23.1455S. doi:10.1016/j.quascirev.2003.12.015. ^ Owen, Lewis A.; et al. (2002). "A note on the extent of glaciation throughout the Himalaya during the global Last Glacial Maximum". Quaternary Science Reviews. 21 (1): 147–157. Bibcode:2002QSRv...21..147O. doi:10.1016/S0277-3791(01)00104-4. ^ Kuhle, M., Kuhle, S. (2010): Review on Dating methods: Numerical Dating in the Quaternary of High Asia. In: Journal of Mountain Science (2010) 7: 105-122. ^ Chevalier, Marie-Luce; et al. (2011). "Constraints on the late Quaternary glaciations in Tibet from cosmogenic exposure ages of moraine surfaces". Quaternary Science Reviews. 30 (5–6): 528–554. Bibcode:2011QSRv...30..528C. doi:10.1016/j.quascirev.2010.11.005. ^ Kuhle, Matthias (2002). "A relief-specific model of the ice age on the basis of uplift-controlled glacier areas in Tibet and the corresponding albedo increase as well as their positive climatological feedback by means of the global radiation geometry". Climate Research. 20: 1–7. Bibcode:2002ClRes..20....1K. doi:10.3354/cr020001. ^ Ehlers, Gibbard & 2004 III, Kuhle, M (2011-08-31). "The High Glacial (Last Ice Age and LGM) ice cover in High and Central Asia". Quaternary Glaciations - Extent and Chronology. pp. 175–199. ISBN 9780444534477. ^ Lehmkuhl, F. (2003). "Die eiszeitliche Vergletscherung Hochasiens – lokale Vergletscherungen oder übergeordneter Eisschild?". Geographische Rundschau. 55 (2): 28–33. ^ Zhijiu Cui; et al. (2002). "The Quaternary glaciation of Shesan Mountain in Taiwan and glacial classification in monsoon areas". Quaternary International. 97–98: 147–153. Bibcode:2002QuInt..97..147C. doi:10.1016/S1040-6182(02)00060-5. ^ Yugo Ono; et al. (September–October 2005). "Mountain glaciation in Japan and Taiwan at the global Last Glacial Maximum". Quaternary International. 138–139: 79–92. Bibcode:2005QuInt.138...79O. doi:10.1016/j.quaint.2005.02.007. ^ Young, James A.T.; Hastenrath, Stefan (1991). "Glaciers of the Middle East and Africa – Glaciers of Africa" (PDF 1.25 Mb). U.S. Geological Survey Professional Paper 1386-G-3. ^ Lowell, T.V. ; et al. (1995). "Interhemisperic correlation of late Pleistocene glacial events" (PDF 2.3 Mb). Science. 269 (5230): 1541–9. Bibcode:1995Sci...269.1541L. doi:10.1126/science.269.5230.1541. 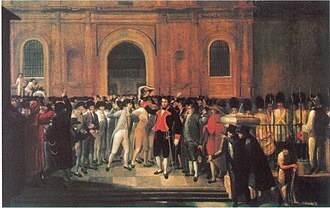 PMID 17789444. ^ Ollier, C.D. "Australian Landforms and their History". National Mapping Fab. Geoscience Australia. Archived from the original on August 8, 2008. ^ Burrows, C. J.; Moar, N. T. (1996). "A mid Otira Glaciation palaeosol and flora from the Castle Hill Basin, Canterbury, New Zealand" (PDF). New Zealand Journal of Botany. 34 (4): 539–545. doi:10.1080/0028825X.1996.10410134. Archived from the original (PDF 340 Kb) on February 27, 2008. ^ Allison, Ian; Peterson, James A. (1988). Glaciers of Irian Jaya, Indonesia: Observation and Mapping of the Glaciers Shown on Landsat Images. ISBN 978-0-607-71457-9. U.S. Geological Survey professional paper 1386. ^ a b c d e Mills, S.C.; Barrows, T.T. ; Telfer, M.W. ; Fifield, L.K. (2017). "The cold climate geomorphology of the Eastern Cape Drakensberg: A reevaluation of past climatic conditions during the last glacial cycle in Southern Africa". Geomorphology. 278: 184–194. Bibcode:2017Geomo.278..184M. doi:10.1016/j.geomorph.2016.11.011. ^ a b c d Sumner, P.D. (2004). "Geomorphic and climatic implications of relict openwork block accumulations near Thabana-Ntlenyana, Lesotho". Geografiska Annaler Series A: Physical Geography. 86 (3): 289–302. doi:10.1111/j.0435-3676.2004.00232.x. ^ a b Mills, Stephanie C.; Grab, Stefan W.; Rea, Brice R.; Farrow, Aidan (2012). "Shifting westerlies and precipitation patterns during the Late Pleistocene in southern Africa determined using glacier reconstruction and mass balance modelling". Quaternary Science Reviews. 55: 145–159. Bibcode:2012QSRv...55..145M. doi:10.1016/j.quascirev.2012.08.012. ^ a b Hall, Kevin (2010). "The shape of glacial valleys and implications for southern African glaciation". South African Geographical Journal. 92 (1): 35–44. doi:10.1080/03736245.2010.485360. ^ "Like 'champagne bottles being opened': Scientists document an ancient Arctic methane explosion". The Washington Post. June 1, 2017. ^ Anderson, J. B.; Shipp, S. S.; Lowe, A. L.; Wellner, J. S.; Mosola, A. B. (2002). "The Antarctic Ice Sheet during the Last Glacial Maximum and its subsequent retreat history: a review". Quaternary Science Reviews. 21 (1–3): 49–70. Bibcode:2002QSRv...21...49A. doi:10.1016/S0277-3791(01)00083-X. ^ Ehlers, Gibbard & 2004 III, Ingolfsson, O. Quaternary glacial and climate history of Antarctica (PDF). pp. 3–43. ^ Huybrechts, P. (2002). "Sea-level changes at the LGM from ice-dynamic reconstructions of the Greenland and Antarctic ice sheets during the glacial cycles". Quaternary Science Reviews. 21 (1–3): 203–231. Bibcode:2002QSRv...21..203H. doi:10.1016/S0277-3791(01)00082-8. ^ Behre Karl-Ernst, van der Plicht Johannes (1992). "Towards an absolute chronology for the last glacial period in Europe: radiocarbon dates from Oerel, northern Germany". Vegetation History and Archaeobotany. 1 (2): 111–117. doi:10.1007/BF00206091. ^ "Brief geologic history". Rocky Mountain National Park. Archived from the original on May 15, 2006. ^ "Ice Age Floods". U.S. National Park Service. ^ Funder, Svend "Late Quaternary stratigraphy and glaciology in the Thule area, Northwest Greenland". MoG Geoscience. 22: 63. 1990. Archived from the original on June 6, 2007. ^ Johnsen, Sigfus J.; et al. (1992). "A "deep" ice core from East Greenland". MoG Geoscience. 29: 22. Archived from the original on June 6, 2007. ^ Schubert, Carlos (1998). "Glaciers of Venezuela". US Geological Survey (USGS P 1386-I). ^ Schubert, C.; Valastro, S. (1974). "Late Pleistocene glaciation of Páramo de La Culata, north-central Venezuelan Andes" (PDF). Geologische Rundschau. 63 (2): 516–538. Bibcode:1974GeoRu..63..516S. doi:10.1007/BF01820827. ^ Maximiliano, B.; Orlando, G.; Juan, C.; Ciro, S. "Glacial Quaternary geology of las Gonzales basin, páramo los conejos, Venezuelan andes". ^ Trombotto Liaudat, Darío (2008). "Geocryology of Southern South America". In Rabassa, J. 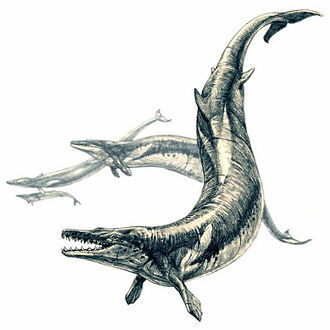 The Late Cenozoic of Patagonia and Tierra del Fuego. pp. 255–268. ISBN 978-0-444-52954-1. ^ Adams, Jonathan. "South America during the last 150,000 years". Archived from the original on January 30, 2010. Bowen, D.Q. (1978). Quaternary geology: a stratigraphic framework for multidisciplinary work. Oxford UK: Pergamon Press. ISBN 978-0-08-020409-3. Ehlers, J.; Gibbard, P. L., eds. (2004). Quaternary Glaciations: Extent and Chronology 2: Part II North America. Amsterdam: Elsevier. ISBN 978-0-444-51462-2. Ehlers, J.; Gibbard, P. L., eds. (2004). Quaternary Glaciations: Extent and Chronology 3: Part III: South America, Asia, Africa, Australia, Antarctica. Amsterdam: Elsevier. ISBN 978-0-444-51593-3. Harris, A. G.; Tuttle, E.; Tuttle, S. D. (1997). Geology of National Parks (5th ed.). Iowa: Kendall/Hunt. ISBN 978-0-7872-5353-0. Kuhle, M. (1988). "The Pleistocene Glaciation of Tibet and the Onset of Ice Ages — An Autocycle HypothesisGeoJournal". 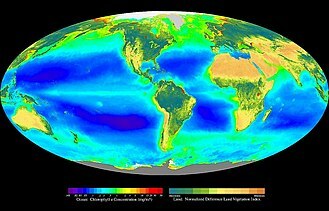 GeoJournal. 17 (4): 581–596. doi:10.1007/BF00209444. Mangerud, J.; Ehlers, J.; Gibbard, P., eds. (2004). Quaternary Glaciations : Extent and Chronology 1: Part I Europe. Amsterdam: Elsevier. ISBN 978-0-444-51462-2. Sibrava, V.; Bowen, D.Q; Richmond, G. M. (1986). "Quaternary Glaciations in the Northern Hemisphere". Quaternary Science Reviews. 5: 1–514. doi:10.1016/S0277-3791(86)80002-6. Pielou, E. C. (1991). After the Ice Age : The Return of Life to Glaciated North America. Chicago IL: University Of Chicago Press. ISBN 978-0-226-66812-3. Ray, N.; Adams, J.M. (2001). "A GIS-based Vegetation Map of the World at the Last Glacial Maximum (25,000–15,000 BP)" (PDF). Internet Archaeology. 11. The Himalayas, or Himalaya, form a mountain range in Asia separating the plains of the Indian subcontinent from the Tibetan Plateau. The Himalayan range has the Earths highest peaks, including the highest, the Himalayas include over a hundred mountains exceeding 7,200 metres in elevation. By contrast, the highest peak outside Asia – Aconcagua, in the Andes – is 6,961 metres tall. The Himalayas are spread across five countries, India, China, the Himalayan range is bordered on the northwest by the Karakoram and Hindu Kush ranges, on the north by the Tibetan Plateau, and on the south by the Indo-Gangetic Plain. 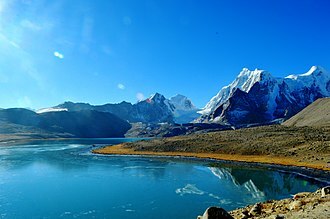 Some of the major rivers, the Indus, the Ganges, and the Tsangpo-Brahmaputra, rise in the Himalayas. The Himalayas have profoundly shaped the cultures of South Asia, many Himalayan peaks are sacred in Hinduism and Buddhism. Lifted by the subduction of the Indian tectonic plate under the Eurasian Plate and its western anchor, Nanga Parbat, lies just south of the northernmost bend of Indus river. Its eastern anchor, Namcha Barwa, is just west of the bend of the Tsangpo river. The range varies in width from 400 kilometres in the west to 150 kilometres in the east, the name of the range derives from the Sanskrit Himā-laya, from himá and ā-laya. 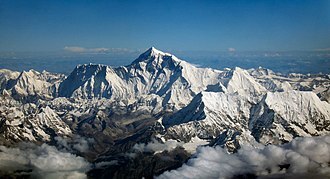 They are now known as the Himalaya Mountains, usually shortened to the Himalayas, they were described in the singular as the Himalaya. This was previously transcribed Himmaleh, as in Emily Dickinsons poetry and Henry David Thoreaus essays. The mountains are known as the Himālaya in Nepali and Hindi, the Himalaya or The Land of Snow in Tibetan, the Hamaleh Mountain Range in Urdu, the flora and fauna of the Himalayas vary with climate, rainfall and soils. The climate ranges from tropical at the base of the mountains to permanent ice, the amount of yearly rainfall increases from west to east along the southern front of the range. This diversity of altitude and soil conditions combined with the high snow line supports a variety of distinct plant. The extremes of high altitude combined with extreme cold favor extremophile organisms, the unique floral and faunal wealth of the Himalayas is undergoing structural and compositional changes due to climate change. It extends from the earliest known use of stone tools, probably by Homo habilis initially,2.6 million years ago, to the end of the Pleistocene around 10,000 BP. 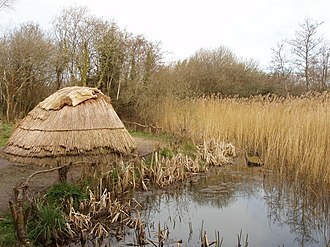 The Paleolithic era is followed by the Mesolithic, the date of the Paleolithic–Mesolithic boundary may vary by locality as much as several thousand years. 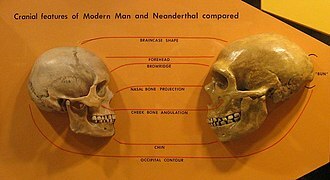 During the Paleolithic period, humans grouped together in small societies such as bands, the Paleolithic is characterized by the use of knapped stone tools, although at the time humans used wood and bone tools. Other organic commodities were adapted for use as tools, including leather and vegetable fibers, due to their nature, surviving artifacts of the Paleolithic era are known as paleoliths. 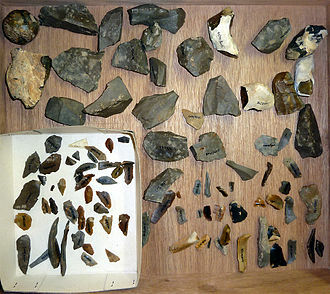 About 50,000 years ago, there was a increase in the diversity of artifacts. For the first time in Africa, bone artifacts and the first art appear in the archaeological record, the first evidence of human fishing is noted, from artifacts in places such as Blombos cave in South Africa. The new technology generated an explosion of modern humans which is believed to have led to the extinction of the Neanderthals. 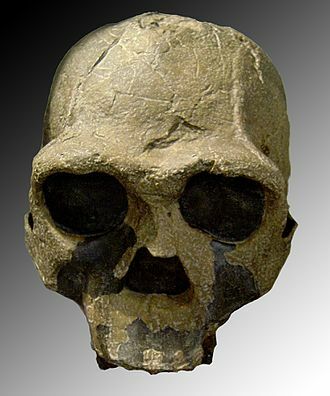 Humankind gradually evolved from members of the genus Homo—such as Homo habilis. The climate during the Paleolithic consisted of a set of glacial and interglacial periods in which the climate periodically fluctuated between warm and cool temperatures, by c. 50,000 – c. 40,000 BP, the first humans set foot in Australia. By c. 45,000 BP, humans lived at 61°N latitude in Europe, by c. 30,000 BP, Japan was reached, and by c. 27,000 BP humans were present in Siberia, above the Arctic Circle. At the end of the Upper Paleolithic, a group of humans crossed Beringia, the term Paleolithic was coined by archaeologist John Lubbock in 1865. It derives from Greek, παλαιός, old, and λίθος, stone, human evolution is the part of biological evolution concerning the emergence of anatomically modern humans as a distinct species. 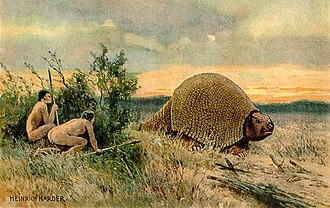 The Paleolithic Period coincides almost exactly with the Pleistocene epoch of geologic time and this epoch experienced important geographic and climatic changes that affected human societies. The Antarctic ice sheet is one of the two polar ice caps of the Earth. 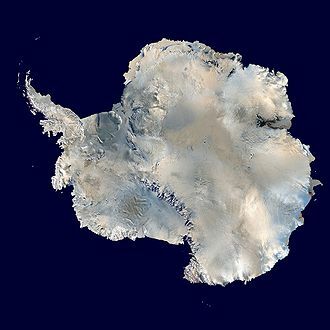 It covers about 98% of the Antarctic continent and is the largest single mass of ice on Earth and it covers an area of almost 14 million square kilometres and contains 26.5 million cubic kilometres of ice. That is, approximately 61 percent of all water on the Earth is held in the Antarctic ice sheet. In East Antarctica, the ice sheet rests on a land mass. Much of the land in this area would be seabed if the ice sheet were not there, in contrast to the melting of the Arctic sea ice, sea ice around Antarctica was expanding as of 2013. CO2 levels were about 760 ppm and had been decreasing from earlier levels in the thousands of ppm, carbon dioxide decrease, with a tipping point of 600 ppm, was the primary agent forcing Antarctic glaciation. The opening of the Drake Passage may have played a role as well though models of the changes suggest declining CO2 levels to have more important. According to a 2009 study, the average surface temperature trend of Antarctica is positive. West Antarctica has warmed by more than 0.1 °C/decade in the last 50 years, although this is partly offset by fall cooling in East Antarctica, this effect is restricted to the 1980s and 1990s. Ice enters the sheet through precipitation as snow and this snow is compacted to form glacier ice which moves under gravity towards the coast. Most of it is carried to the coast by fast moving ice streams, the ice passes into the ocean, often forming vast floating ice shelves. These shelves melt or calve off to give icebergs that eventually melt, if the transfer of the ice from the land to the sea is balanced by snow falling back on the land there will be no net contribution to global sea levels. A2006 paper derived from data, measures changes in the gravity of the ice mass. 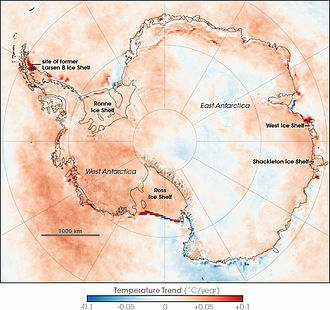 A2008 study compared the ice leaving the ice sheet, by measuring the ice velocity and thickness along the coast and this found that the East Antarctic Ice Sheet was in balance but the West Antarctic Ice Sheet was losing mass. This was largely due to acceleration of ice streams such as Pine Island Glacier and these results agree closely with the gravity changes. In the Alpine region it corresponds to the Würm glaciation. 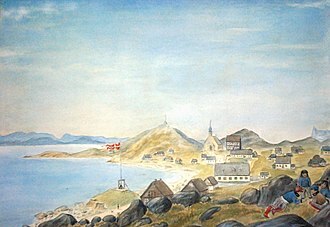 It was characterised by an ice sheet that spread out from the Scandinavian Mountains and extended as far as the east coast of Schleswig-Holstein. In Northern Europe it was the youngest of the glacials of the Pleistocene ice age, the preceding warm period in this region was the Eemian interglacial. The last cold period began about 115,000 years ago and its end corresponds with the end of the Pleistocene epoch and start of the Holocene. About 115,000 years ago average temperatures dropped markedly and warmth-loving woodland species were displaced and this significant turning point in average temperatures marked the end of the Eemian interglacial and start of the Weichselian glacial stage. It is divided into three sections, based on the variation, the Weichselian Early Glacial, the Weichselian High Glacial. 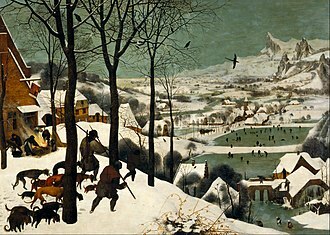 During the Weichselian, there were frequent major variations in climate in the northern hemisphere, the Weichsel Early Glacial is in turn divided into four stages, Odderade Interstadial. The pollen spectra indicate a boreal forest and it starts with a tree birch phase, which rapidly transitions to pine forest. Also apparent are larches and spruce as well as low numbers of alder, in North Germany the pollen spectra indicate a grassy tundra followed by shrubby tundra. Several profiles show a period of cooling shortly after the start of the Brörup Interstadial. This led some authors to distinguish the first warm period as the Amersfoort Interstadial, since then, this first warm period and cooling phase has been included in the Brörup Interstadial. Northern Central Europe was populated by birch and pine woods, the Brörup Interstadial is identified with marine isotope stage 5c. The Herning Stadial was the first cold phase, in which northwestern Europe was largely treeless and it corresponds to marine isotope stage 5d. In the Weichselian High Glacial the ice advanced into North Germany. In this period, several interstadials have been documented and ice sheet advances to North Germany. The Last Glacial Maximum was the last period in the Earths climate history during the last glacial period when ice sheets were at their greatest extension. Growth of the ice sheets reached their positions in about 24,500 BCE. Vast ice sheets covered much of North America, northern Europe, the ice sheets profoundly affected Earths climate by causing drought, and a dramatic drop in sea levels. It was followed by the Late Glacial, the formation of an ice sheet or ice cap requires both prolonged cold and precipitation. Hence, despite having temperatures similar to those of glaciated areas in North America and Europe and this difference was because the ice sheets in Europe produced extensive anticyclones above them. These anticyclones generated air masses that were so dry on reaching Siberia and Manchuria that precipitation sufficient for the formation of glaciers could never occur, all over the world, climates at the Last Glacial Maximum were cooler and almost everywhere drier. Even in less affected regions, rainforest cover was greatly diminished, only in Central America and the Chocó region of Colombia did tropical rainforests remain substantially intact – probably due to the extraordinarily heavy rainfall of these regions. Most of the worlds deserts expanded and this occurred in Afghanistan and Iran, where a major lake formed in the Dasht-e Kavir. In Australia, shifting sand dunes covered half the continent, whilst the Chaco, in northern China – unglaciated despite its cold climate – a mixture of grassland and tundra prevailed, and even here, the northern limit of tree growth was at least 20° farther south than today. During the Last Glacial Maximum, much of the world was cold and inhospitable, with frequent storms, the dustiness of the atmosphere is a prominent feature in ice cores, dust levels were as much as 20 to 25 times greater than now. This was probably due to a number of factors, reduced vegetation, stronger global winds, the massive sheets of ice locked away water, lowering the sea level, exposing continental shelves, joining land masses together, and creating extensive coastal plains. 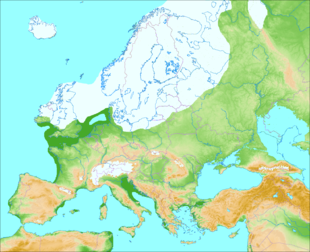 During the last glacial maximum,21,000 years ago, Northern Europe was largely covered by ice, the southern boundary of the ice sheets passing through Germany and Poland. In ecology, primary production is the synthesis of organic compounds from atmospheric or aqueous carbon dioxide. Almost all life on Earth relies directly or indirectly on primary production, the organisms responsible for primary production are known as primary producers or autotrophs, and form the base of the food chain. In terrestrial ecoregions, these are mainly plants, while in aquatic ecoregions algae predominate in this role, ecologists distinguish primary production as either net or gross, the former accounting for losses to processes such as cellular respiration, the latter not. Primary production is the production of energy in organic compounds by living organisms. 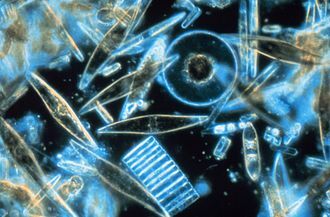 The main source of energy is sunlight but a minute fraction of primary production is driven by lithotrophic organisms using the chemical energy of inorganic molecules. Regardless of its source, this energy is used to complex organic molecules from simpler inorganic compounds such as carbon dioxide. Consumption of primary producers by heterotrophic organisms, such as animals, transfers these organic molecules up the food web, gross primary production is the amount of chemical energy as biomass that primary producers create in a given length of time. Some fraction of this energy is used by primary producers for cellular respiration. The remaining fixed energy is referred to as net primary production, some net primary production goes toward growth and reproduction of primary producers, while some is consumed by herbivores. Both gross and net primary production are in units of mass per area per unit time interval. In terrestrial ecosystems, mass of carbon per area per year is most often used as the unit of measurement. On the land, almost all production is now performed by vascular plants, with a small fraction coming from algae and non-vascular plants such as mosses. 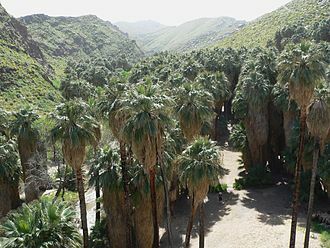 Before the evolution of plants, non-vascular plants likely played a more significant role. Primary production on land is a function of many factors, but principally local hydrology, while plants cover much of the Earths surface, they are strongly curtailed wherever temperatures are too extreme or where necessary plant resources are limiting, such as deserts or polar regions. Water is consumed in plants by the processes of photosynthesis and transpiration, the latter process is driven by the evaporation of water from the leaves of plants. The Holocene is the geological epoch that began after the Pleistocene at approximately 11,700 years before present. The term Recent has often used as an exact synonym of Holocene. The Holocene is part of the Quaternary period and its name comes from the Ancient Greek words ὅλος and καινός, meaning entirely recent. It has been identified with the current warm period, known as MIS1, given these, a new term, Anthropocene, is specifically proposed and used informally only for the very latest part of modern history involving significant human impact. It is accepted by the International Commission on Stratigraphy that the Holocene started approximately 11,700 years ago, the epoch follows the Pleistocene and the last glacial period. The Holocene can be subdivided into five time intervals, or chronozones, based on climatic fluctuations, Boreal, Atlantic and they find a general correspondence across Eurasia and North America, though the method was once thought to be of no interest. The scheme was defined for Northern Europe, but the changes were claimed to occur more widely. The periods of the include a few of the final pre-Holocene oscillations of the last glacial period. Paleontologists have not defined any faunal stages for the Holocene, if subdivision is necessary, periods of human technological development, such as the Mesolithic and Bronze Age, are usually used. 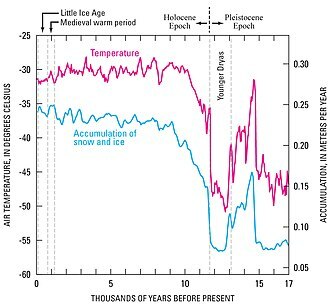 However, the time periods referenced by these terms vary with the emergence of those technologies in different parts of the world, the Holocene may be divided evenly into the Hypsithermal and Neoglacial periods, the boundary coincides with the start of the Bronze Age in Europe. According to some scholars, a division, the Anthropocene, has now begun. Continental motions due to plate tectonics are less than a kilometre over a span of only 10,000 years, ice melt caused world sea levels to rise about 35 m in the early part of the Holocene. 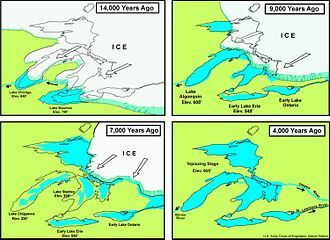 The sea level rise and temporary land depression allowed temporary marine incursions into areas that are now far from the sea, Holocene marine fossils are known, for example, from Vermont and Michigan. The Arctic ice pack is the ice cover of the Arctic Ocean and its vicinity. The Arctic ice pack undergoes a seasonal cycle in which ice melts in spring and summer, reaches a minimum around mid-September, increases during fall. Summer ice cover in the Arctic is about 50% of winter cover, some of the ice survives from one year to the next. Currently 28% of Arctic basin sea ice is ice, thicker than seasonal ice, up to 3–4 meters thick over large areas. As well as the seasonal cycle there has been an underlying trend of declining sea ice in the Arctic in recent decades. Sea ice has an important effect on the balance of the polar oceans, since it insulates the warm ocean from the much colder air above. Sea ice is highly reflective of solar radiation, reflecting about 60% of incoming solar radiation when bare and this is much greater than the reflectivity of the sea and thus the ice affects the absorption of sunlight at the surface. The sea ice cycle is an important source of dense bottom water, while freezing, water rejects its salt content, leaving pure ice. The remaining surface water, made dense by the salinity, sinks. This production of water is a factor in maintaining the thermohaline circulation. In the Arctic, a key area where pancake ice forms the dominant ice type over a region is the so-called Odden ice tongue in the Greenland Sea. Most of the old ice continues south, driven by the wind, so an open water surface is exposed on which new ice forms as frazil. Reliable measurements of sea ice edge begin within the satellite era, from the late 1970s, the Scanning Multichannel Microwave Radiometer on Seasat and Nimbus 7 satellites provided information that was independent of solar illumination or meteorological conditions. The frequency and accuracy of passive microwave measurements improved with the launch of the DMSP F8 Special Sensor Microwave/Imager SSMI in 1987. Both the sea ice area and extent are estimated, with the latter being larger, the trends from 1979 to 2002 have been a statistically significant Arctic sea ice decrease of −2. 5% ±0. 9% per decade during those 23 years. 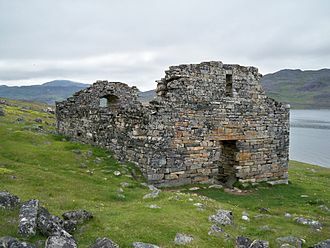 The last written records of the Norse Greenlanders are from a 1408 marriage at Hvalsey Church, now the best-preserved of the Norse ruins. Location of the weather station Alert. Extension of the ice at 15 September 2008 (36 Mpx). Global oceanic and terrestrial photoautotroph abundance, from September 1997 to August 2000. As an estimate of autotroph biomass, it is only a rough indicator of primary-production potential, and not an actual estimate of it. Provided by the SeaWiFS Project, NASA/Goddard Space Flight Center and ORBIMAGE. 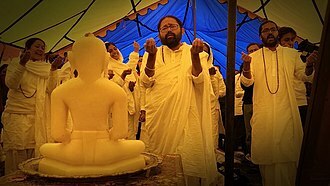 Jain pilgrims paying obeisance to Tirthankar Rishabhdev near Mount Kailash. 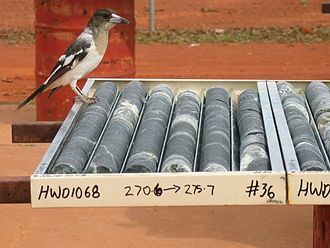 Rock core samples, the product of a diamond rig. A pied butcherbird perches nearby. Granitic rock core from Stillwater igneous complex, Montana (from a spoil pile). 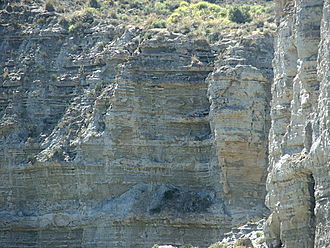 View of the Eemian-aged coastal terraces of Niebla near Valdivia, Chile. Eemian erosion surface in a fossil coral reef on Great Inagua, The Bahamas. Foreground shows corals truncated by erosion; behind the geologist is a post-erosion coral pillar which grew on the surface after sea level rose again. Bittium reticulatum Picture from Harting (1886) assigned by him as 'Index fossil' for the Eemian. Antarctic Skin Temperature Trends between 1981 and 2007, based on thermal infrared observations made by a series of NOAA satellite sensors. Skin temperature trends do not necessarily reflect air temperature trends. 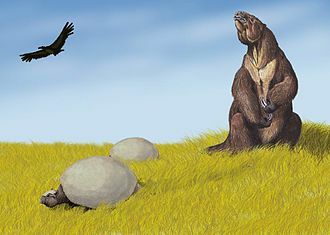 Pleistocene of South America showing Megatherium and two Glyptodon. This image shows temperature changes, determined as proxy temperatures, taken from the central region of Greenland's ice sheet during Late Pleistocene and Beginning of Holocene.